Staphylococcus aureus (also called Staph aureus or Staph) is a type of bacteria (germ) that commonly lives on healthy skin. Some people carry Staph in moist areas on their body such as their nostrils, armpits and groin. Staph is usually harmless and not noticeable. But if the skin is very dry, scratched or grazed, the bacteria can multiply and cause skin infections. 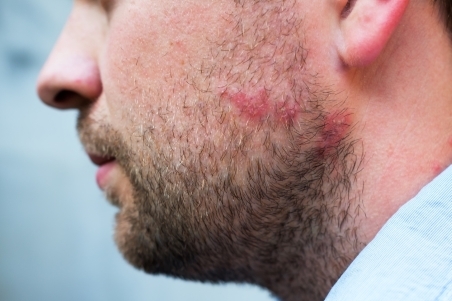 The infected skin is generally red, swollen and painful. Sometimes there can be pus and an unpleasant smell. Types of infections include boils, abscesses, impetigo (school sores), cellulitis and folliculitis. How is a Staph skin infection treated? There are some simple steps to treat a Staph skin infection. Practise good personal hygiene, including washing yourself daily. Practise good hand hygiene. This includes washing your hands often with ordinary soap and water. Use antiseptic cleaners along with antiseptic creams. Ask your pharmacist if you need advice. Cut your nails short. This helps with hygiene and can stop you causing further damage by scratching wounds or itchy skin. Cover all infected sores, cuts or wounds with a plaster. Supermarket plasters are fine to use. You may be prescribed antibiotics, but some Staph bacteria are resistant to many commonly used antibiotics. If you have repeated staph skin infections, you may need to try to remove the staph from your skin. This is called Staph decolonisation. How can I avoid spreading a Staph skin infection? To reduce the risk of spreading a Staph skin infection, practise good hand hygiene. This is especially important before and after touching or cleaning an infected area, after going to the toilet, and before handling and eating food. DermNet NZ – Staphylococcal skin infection. Retrieved November 2017.